The following list contains exclusive World of Warcraft loot that was only available to convention attendees, or to subscribers of the PPV events on television or online. Due to their limited availability, these loot items are some of the rarest and most valuable loots in the game. Murky was a gift distributed to attendees of BlizzCon 2005. Murky is a cute little baby pet Murloc who occasionally likes to whip out his top hat and cane, followed by a little song and dance routine. It's quite comical, especially for fans of the classic Looney Tunes dancing frog. Murky is extremely rare, as there were only 8,000 loot codes distributed for him. If you can find a Murky loot code for sale on ebay, expect to pay anywhere from $1,500 to $2,000 for it. Murky binds to your entire WoW account, so all present and future characters will be able to enjoy this cute little companion by their side. Murky is super rare, so it's unusual to see any of these loot codes available, but you can click here to search eBay for availability. The Murloc Costume was given to attendees of BllizzCon 2007. Players can use this item to dress their characters up in a Murloc Costume. The Murloc Costume is not only hilarious looking, but it also possesses several unique and entertaining emotes. In fact, the Murloc Costume has its own special animation for just about every character emote that exists. The costume "buff" lasts for one hour, but will cancel as soon as you eat, attack or take damage. The Murloc Costume can be worn while mounted. It's believed that Blizzard issued only 15,000 loot codes for the Murloc Costume, making it a very rare and prized loot item. The Murloc Costume is account bound, so all present and future characters within a given WoW account will be able to don this amusing getup. Unused BlizzCon 2007 Murloc Costume loot codes are extremely scarce, but you can try a search on ebay to see if any are available. The Big Blizzard Bear mount was issued as a gift to attendees of BlizzCon 2008, as well as to subscribers of the BlizzCon PPV event on DIRECTV. The Big Blizzard Bear adjusts its travel speed depending upon the character's riding skill level. The Big Blizzard Bear is similar to the difficult-to-obtain White Polar Bear, but with less armor, and with the addition of a very awesome flag waving Murloc atop it. Here's a video demonstration of the Big Blizzard Bear. The character in the video is also rocking the Murloc Costume from BlizzCon '07. Only 13,000 of these loot codes were distributed, making the Big Blizzard Bear a very rare mount. This mount binds to an entire WoW account, so purchasers of the loot code will be able to use this mount for all present and future characters. No items matching the keyword phrase "big blizzard bear" were found. This could be due to the keyword phrase used, or could mean your server is unable to communicate with Ebays RSS2 Server. Tyrael's Hilt was an exclusive WoW pet loot given out to attendees of the 2008 Blizzard Entertainment Worldwide Invitational in Paris, France. Only 8,000 loot codes for Tyrael's Hilt were issued, making this an extremely rare WoW pet loot item. When used, Tyrael's Hilt summons an amazing little non-combat pet called Mini-Tyrael. Mini Tyrael possesses some really cool and unique animations. When summoned, he will float next to your character at shoulder-level, then occasionally fall asleep when idle. While asleep, Tyrael will snore, roll over, and occasionally scratch his backside. When he awakes, he lets loose with his own mini-version of a Battle Shout emote. Mini Tyrael also responds to the /dance command, which causes him to start busting a move. Other players can get the party started as well, just by clicking on your pet and typing /dance. Tyrael's Hilt is probably the rarest and most sought after pet loot in the game. Only 8,000 of these loot codes were distributed, which makes this a very uncommon and super-hot WoW collectible. Tyrael's Hilt binds to all present and future characters within a single WoW account. Mini Tyrael is crazy rare, so you may have trouble finding one, and if you do manage to locate an unused loot code, be prepared to empty your wallet. Mini Tyrael loot codes usually go for over $1,500. Click here to search for a Mini Tyrael loot code on ebay. 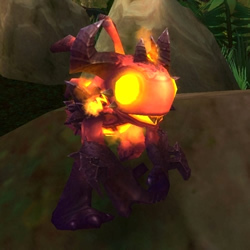 Grunty is the pet loot that was given out to attendees of BlizzCon 2009, as well as to subscribers of the BlizzCon PPV event on DIRECTV. Grunty is a Murloc version of the Marine unit from StarCraft. Grunty is a rough and ready, armor wearing, gun wielding, Zergling-slaying Murloc Marine. Grunty has quite a few amusing emotes where he unleashes the power of his Gauss Rifle, as well as one where he spins it around just like a a gunfighter from the old west would twirl his six shooter. Grunty will often turn his head left and right - looking for Zerglings. He'll then unleash a powerful spray of automatic gunfire, occasionally followed by him firing an explosive charge into the air - the recoil from the blast knock him on his behind. One really exciting behavior that Grunty has will trigger when he's in the presence of a Zergling. Zerglings are pretty rare (only available to owners of the original World of Warcraft Collector's Edition ), so you may not encounter many of them, but when Grunty comes within ten yards of one they will fight. If Grunty wins, the Zergling will be shot dead, then keel over on the ground in a somewhat anti-climactic manner. If the Zergling wins, on the other hand, Grunty will explode into a mess of green goo. Here's a video showing Grunty in action, including a demo of what happens when Grunty is in the presence of a Zergling pet. Also featured in this video are Murkimus the Gladiator (reward for competing in the Arena Tournament), along with Mini-Tyrael. There were 20,000 loot codes issued for Grunty, which means it's a pretty rare pet, but still relatively affordable. Grunty binds to your entire WoW account, so all of your current and future characters will be able to summon this Murloc Marine. Deathy is the fire-breathing, world shattering Murloc pet loot which was given to attendees of BlizzCon 2010, as well as to subscribers of the BlizzCon PPV event on DIRECTV. Deathy has a few amusing animations, which include: puffing a smoke ring, spewing out a stream of fire-breath, and another where he leaps into the air and reigns fire upon the ground below. He also lets out some pretty cool gutteral Murloc/Deathwing emotes when clicked on. Wach the video below to get a preview of him in action. Deathy is an incredibly entertaining pet, and one that can still be had at a pretty affordable price. However, there were only 20,000 loot codes issued, so as more of them are redeemed, Deathy's price is only going to climb as supplies become more limited. Deathy will bind to your entire WoW account, so all of your current and future characters will be able to have this little world-breaking Murloc tagging along beside them. Murkablo is the half Murloc / half Prime Evil pet that was given out to attendees of BlizzCon 2011, as well as to subscribers of the BlizzCon PPV event on DIRECTV. Murkablo's animations are pretty much the same as Deathy's - the BlizzCon 2010 pet. He breathes fire and puffs smoke rings, but what is different are his sinister emotes. Clicking on Murkablo causes him to let out some pretty disturbing other-worldly sounds. Murkablo binds to your entire WoW account, so all of your current and future characters will be able to summon this aquatic prime evil. Murkalot is the exclusive pet loot item which was distributed to BlizzCon 2013 attendees, as well as purchasers of the BlizzCon 2013 Virtual Ticket. Murkalot is a Murloc pet themed after the Crusader class which will be debuting in the upcoming expansion to Diablo 3..."Reaper of Souls". Murkalot has some amazing animations and some extremely colorful pet battle abilities. Watch the video below for more info on this cool new pet and to see some of his abilities in action. 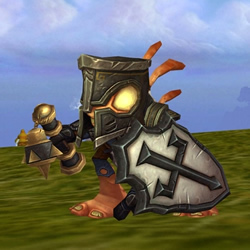 Murkalot binds to your entire WoW account, so all of your current and future characters will be able to summon this righteous little Murloc Crusader.